The Securities and Exchange Commission says Jeffrey Wall of Freeport told investors that their money would fund New England music concerts and festivals but he used some of it to pay off debts. Federal regulators are accusing a Freeport man and his company of investment fraud, saying he solicited $3 million from nearly 150 investors by falsely promising to use their money to organize Christian music concerts and festivals. The U.S. Securities and Exchange Commission said in a complaint filed Thursday in U.S. District Court that concert promoter Jeffrey E. Wall and his business, The Lighthouse Events LLC, instead used some investor funds for other purposes, such as paying off debts and investors from previous deals. The complaint says Wall also made promises and guarantees to investors that he did not honor. 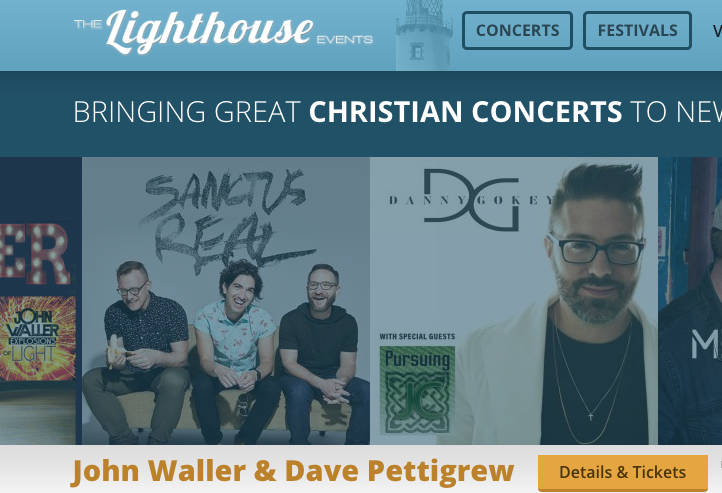 According to The Lighthouse Events’ website, the company is an active business founded by Wall and his wife, both avowed Christians, that has organized over 700 faith-based concerts since its founding in 2008. The company organized and promoted concerts for acts such as the Oak Ridge Boys in March of last year, and other Christian-themed groups such as Vertical Workshop and Sanctus Real that often perform in small church settings. The SEC complaint says that from about January 2014 through October 2018, Wall and Lighthouse raised more than $3 million from roughly 145 investors to promote Christian entertainment events in New England. Wall and Lighthouse falsely told potential investors that their money would be used solely to promote and host the concerts and festivals, the complaint says, adding that Wall also claimed repayment of the investment was “secured” and “guaranteed” within one year. However, Wall used some investor funds for other expenses, including payment of Lighthouse’s existing debt and payments to earlier investors using later investors’ money, the complaint says. Wall and Lighthouse also failed to disclose information to potential investors about Lighthouse’s deteriorating financial condition from declining ticket sales and its growing high-interest debt from short-term loans, the complaint says. Wall and Lighthouse have failed to repay roughly $1.6 million of the funds it fraudulently collected from investors, the SEC says. The complaint alleges that Wall and Lighthouse violated anti-fraud provisions of the Securities Act of 1933. The SEC is seeking permanent injunctions, civil penalties and disgorgement plus interest against Wall and Lighthouse. The Better Business Bureau website lists five complaints against Lighthouse, all from investors who say the company failed to repay them with interest as promised. The company responded on the bureau’s website. In the 14-page SEC complaint filed with the court, regulators accuse Wall and his company of “affinity fraud,” which refers to investment scams that prey upon members of identifiable groups such as religious or ethnic communities. The complaint cites an email Wall sent to one potential investor in which he indicated that the investment was guaranteed to be repaid regardless of the company’s financial performance. According to the complaint, Wall and Lighthouse made no effort to sequester and track investor contributions to ensure the money was used solely for the purposes promised to investors. From the beginning, Wall primarily used a single company bank account to deposit all Lighthouse revenues and pay all expenses, it says. The complaint describes Lighthouse as a financially unstable company with court-ordered judgments against it brought by short-term lenders. “As the profitability of Lighthouse’s concerts and festivals dwindled and its borrowing from cash advance companies increased, investor funds were also used for the payment of daily remittances and court-ordered judgments to the cash advance companies as well as for payments to prior investors on older promissory notes,” the complaint says. Christopher Branson, a partner at Portland law firm Murray Plumb & Murray who is not involved with the case, said it’s not uncommon for a legitimate business to run afoul of securities laws when it becomes desperate for cash. Branson, chair of the firm’s business and corporate law practice group, said often it is the overzealous promises a troubled business makes in order to secure the investment that lead to legal violations down the road. According to the Lighthouse website, the company was founded in October 2008 by Wall and his wife, Gail, both California natives and devout Christians. It says Jeffrey Wall is a veteran producer of Christian radio programming, and that the couple decided to start the concert-promotion business after moving to Maine in 2007.